September 15th, 1963, was a cool and overcast morning in Birmingham, Alabama. At the 16th Street Baptist Church, the city’s largest Black congregation, it seemed to be a Sunday like any other. Congregants were at the church, preparing for the day’s sermon, entitled ‘A Love that Forgives.’ Children were milling about the basement of the church, dressing in their choir robes, playing, and preparing for Sunday School. But it wasn’t a Sunday like any other: unknown to the congregants, there were already 15 sticks of dynamite planted under the steps to the church. At dawn that morning, Thomas Edwin Blanton Jr., Herman Frank Cash, Robert Edward Chambliss, and Bobby Frank Cherry – all members of the Ku Klux Klan – had planted at least 15 sticks of dynamite under the steps. At 10:22 AM, a call was placed to the church. 14-year-old Carolyn Maull answered. The caller said: “3 minutes,” and then hung up. In less than 60 seconds, the dynamite exploded. A survivor later said that the entire building shook. The explosion was so powerful that a man passing by in a vehicle was blown out, and windows as far as two blocks away were damaged. 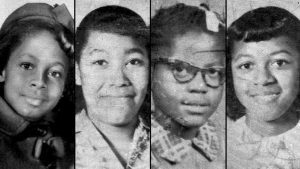 Four girls were murdered: Addie Mae Collins (14), Carol Denise McNair (11), Carole Robertson (14), and Cynthia Wesley (14). If they were alive today, none would be older than 70. The three-story red brick church on 16th Street had long been a refuge and rallying place for civil rights activists. In the spring of 1963, it served as the training location for students who would eventually be arrested during the Birmingham Children’s Crusade, and it housed trainings by the Southern Christian Leadership Conference. It was a regular meeting place for leaders in the movement, like Martin Luther King Jr., Fred Shuttlesworth, and Ralph David Abernathy. 1963 was a particularly tumultuous year for the city of Birmingham. When the Children’s Crusade successfully convinced the city to desegregate schools in May of that year, they were given 90 days to do so. September 4th had been the first day of integrated public education at three schools in the city. The horrific murders of the girls, followed just two months later by the assassination of President Kennedy, opened a nationwide torrent of mourning and anger, a surge of emotional momentum that historians believe helped ensure the passage of the Civil Rights Act the following year. Robert Chambliss was not tried and convicted until 1977. Thomas Edwin Blanton was tried and convicted in 2001 and Bobby Frank Cherry was tried and convicted in 2002. Herman Cash, who died in 1994, was never charged with his alleged involvement in the bombing. In memory of Addie Mae Collins, Carol Denise McNair, Carole Robertson, Cynthia Wesley, and all other victims of racial terror.